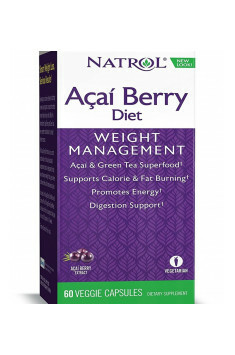 Acai Berry Diet 60 caps. The administration and dosage of thermogenics are individual and depend from personal requirements for the supplement. To evaluate the sensitivity to the supplement, it is advisable to take only one capsule per day for the first few days. After finding individual tolerance to the product, the dose can be increased to the recommended one. The formula should not be taken in the evenings because it can make it more difficult to fall asleep. Fat burners taken with food can be less effective. Food slows down emptying of the stomach and some nutrients can decrease the absorption of active substances from the preparation. After a lapse of time, thermogenics lose their potential. The body gets accustomed to their administration. As a result, a higher dose may be necessary to achieve the desired effects. It is worth taking them in cycles, preferably for 4-8 weeks followed by a 2-4 week break. White tea extract is produced from immature buds Camellia sinensis (from the leaves of the same plant, in a fermentation and rolling process, is produced black tea, and not undergoing fermentation - the green tea). White tea is the noblest variety of tea of the richness of active ingredients. It is characterized by a high content of catechins, including epigallocatechin gallate (EGCG), epigallocatechin (EGC), and numerous flavonoids, potent antioxidant, supporting the binding and elimination of free radicals out of the body. In combination with caffeine it intensifies thermogenesis and allows for the reduction of body fat. The extract of white tea is a component of thermogenic supplements and slimming antioxidants sets, available at www.muscle-zone.pl. Phytase (myo-inositol hexaphosphate phosphohydrolase) is a phosphorolytic enzyme, which is a catalyst for the hydrolysis of phytic acid – a non-digestive, organic form of phosphorus that occurs in cereal grains and seeds of oil plants. The presence of this enzyme was found in plant organisms and in some animals, bacteria, and fungi. Human body does not produce phytase, however, the intestinal microflora of some people (especially vegetarians and vegans) have been proved to contain microbes capable of producing phytases. Phytase promotes degradation of phytic acid, and thus increases the bioavailability of certain nutrients and minerals such as calcium, magnesium, zinc, copper, and iron. In addition, it promotes better digestion and reduces the symptoms that may accompany the consumption of cereals and legumes. In supplementation, phytase does not occur in the form of a mono-preparation. Most often it is one of the components of mixtures containing various digestive enzymes. Lipases, digestive enzymes from the group of hydrolases, secreted by the pancreas and the small intestinal wall, resulting in hydrolytic cleavage of fat food, activated by bile acids decompose triacylglycerols to monoacylglycerol and free fatty acids. A particular application of lipase-containing compounds is indicated as a supplement to the diet of people with high physical activity in the case of a heavy food consumption. The lipases are in the supplements enhancing digestion, available at www.muscle-zone.pl.